To equate the mere mention of the phrase “Israeli apartheid” with anti-Semitism is just as absurd as charging Islamophobia whenever someone rightly accuses the Saudi Arabian government of gender apartheid. Surely it should be possible to discuss issues surrounding the Israeli-Palestinian conflict on their merits rather than just scoring points with debate stopping allegations. Israel’s more rational defenders tend to point out that contrary to how South African blacks were treated under apartheid, Israel’s Arab citizens are allowed to vote, run for office, and participate in the judiciary. But this red herring neglects the most appropriate target of the apartheid analogy, the Occupied Territories. Despite being forced to live under Israeli sovereignty for more than four decades, the Palestinian residents of the West Bank and Gaza Strip have no citizenship rights whatsoever. They are ruled by Israel without the benefit of being able to elect their rulers. And in a striking throwback to the original spirit of apartheid (which literally means “apartness” or “separateness” in Afrikaans), Palestinians are barred from the notorious “Israeli-only” roads, reserved for settlers, that criss-cross the West Bank. In Israel proper, even though the apartheid analogy begins to break down somewhat, the system still might be termed “apartheid lite” on account of what is widely regarded as the second-class citizenship of Israeli Arabs. Yes, they do have de jure political equality, but they are subject to endless racial profiling and chronic municipal underfunding. The semi-governmental Jewish National Fund bars Israeli Arabs from leasing or buying its landholdings. And while Jews like me, even those who have no connection to the country, have the right to travel to Israel and immediately claim citizenship under its Law of Return, Palestinian refugees — many of whom were born in what is now Israel before being expelled in 1948, many of whom still have the keys and deeds to their houses — have for decades been denied their own right of return. All this being said, the term “Israeli apartheid” may now have outlived its usefulness. The analogy remains essentially apt. In fact, many veterans of South Africa’s anti-apartheid struggle, such as Desmond Tutu, have noted the similarities. Sadly, however, it is not enough to be right. Israel’s apologists seem to be winning the public opinion war (at least in Canada), and reliance on the “apartheid” label may be doing the Palestinian solidarity movement more harm than good. 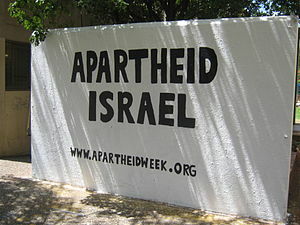 Due perhaps to the habitual insularity and PR myopia of the activist left, Palestinian supporters have allowed their foes to disingenuously define anyone who applies the word “apartheid” to Israel as an irrational extremist. So in the interests of effectively engaging those who currently sit on the fence, the time has probably come to think up some new rhetoric. Or better yet, to forgo flashy rhetoric altogether and just let the facts — which are damning enough on their own — speak for themselves. Update 11/05/2012: This post has been reprinted here on rabble.ca. This entry was posted in Middle East and tagged anti-Semitism, apartheid, Gaza, Israel, Israeli Apartheid Week, Israeli-Palestinian conflict, Law of Return, Occupied Territories, Palestine, right of return, West Bank by David Taub Bancroft. Bookmark the permalink.